Polycystic Ovary Syndrome (PCOS) is the most common problem among women affecting girls as young as 11 years old. This most common hormone abnormality of reproductive-aged women which occurs in up to 10% of such individuals. Let’s take a closer look at PCOS and a few natural remedies that ease PCOS symptoms. PCOS is characterized by overproduction of the androgen testosterone. The normal ovulation does not occur and it cause abnormal menstrual and enlarged ovaries containing multiple small follicles. This hormonal imbalance can cause adverse affect on your overall health and may become cause of health problems like heart diseases, high blood pressure, diabetes and in extreme cases affecting fertility. Related: Do I Have Polycystic Ovarian Syndrome (PCOS)? As a first step towards diagnosing this disease it is important that person submits complete medical history with physical examination to the doctor. Careful monitoring can help out in concluding that whether excess androgen is causing acne, facial hair, obesity, and other health issue or it is something else. For further analysis, doctors might recommend ultrasound and blood tests. These tests helps in determining the functioning of ovaries and can also detect any abnormalities. Doctors usually recommend different mix of medication for fighting this disease. Apart from the medication, we have bought few natural secrets which can help in reducing and in some case completely curing the disease. It is time that you say no to the processed food. Try to keep distance from preservatives and chemicals as they are known to harm your body. Whole foods are considered to be more rich in nutrients. It helps in better digestion and is also considered to be weight controller. This is the most of the famous PCOS natural treatment. It reduces insulin production and regulates blood pressure. Insulin level is directly linked with androgen. If there is less insulin then there will be less androgen and hence lesser negative symptoms that accompanies PCOS. It is best that you use it as a drink. The best way to make it, is to mix two tablespoons of apple cider in a glass of water and to drink it with every meal. This will maintain both sugar, insulin level and will also be a refreshing drink. Green tea is known for its antioxidant properties and is one of the leading home remedies for PCOS. It is better that if you opt for fresh green tea leaves for brewing your green tea. It has anti-inflammatory properties which helps in metabolism. Moreover, it also contains high levels of polyphenols which prevents cellular damage and in turn affects androgen level. So ladies drink 3-4 cup of green tea which can not only help in maintaining your weight but also in fighting PCOS. Indian gooseberry, also known as amla, is considered to be anti-inflammatory food which helps in restoring hormonal balance. It also helps in protecting heart and maintains the level of cholesterol in the blood. So replace your regular fruit juices with drink half a cup of diluted amla juice everyday. Include iron rich food in your daily diet. It is found in red meat and many plant based foods like spinach, berries, lentils, and more. This diet not only helps in digestion but it also improve overall absorption of nutrients. It will also help in reducing cardiovascular diseases, preventing anemia and cancer. Cinnamon extract helps in maintaining blood sugar and improves insulin sensitivity in women. It also helps in burning calories by increasing the metabolism rate. Moreover, the best thing about the extract is that they improve the menstrual cycle which is one of the common symptoms of PCOS. It also has anti-inflammatory properties which is another reason to use it in your food or drinks. Just be careful with the amount and try to keep it between 2-5 gm of cinnamon. Fruits like apricot, plums, peaches contains powerful phytonutrients which are considered to have anti -obesity, anti-inflammatory and anti-diabetics. These fruits reduces cholesterol and reduces cardiovascular disease. They also help in better sleep and can relax you before the bed. So if you are having sleep issues, eat few cherries and have relaxing sleep. If you have abnormal BMI, it is highly recommended that you start healthy regimes. It can help in regularizing your menstrual cycle. Try low calorie diet and start an active lifestyle which will reduce hirsutism. Reducing weight will help you in maintaining your glucose blood level and improving insulin sensitivity. So it is time that you hit gym and try healthy lifestyle for prevention and natural cure of PCOS. If you have PCOS symptoms then best medication is that you need to change your lifestyle. Inactive lifestyle, processed food and lack of major nutrients are considered to be the main trigger of this disease. Though the cure of this disease is still elusive, but it is better that you stay away from processed food, include more iron rich food and increase exercise. This will not only help in fighting PCOS but will also help in preventing many other diseases. Do You Have PCOS Questions? 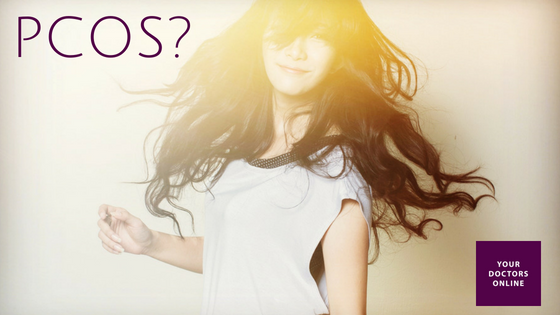 Do you want to know more about PCOS? Are you concerned about your overall health? Message our 24/7 doctor on Free Chat. Get free online consultation and answers to your queries. Simply click below to get started. Arfah Khadija is a passionate and curious businesswoman eager to grow her skills and abilities in brand management and digital marketing. She firmly believes that top brands sell stories that resonate perfectly with consumers. Arfah is a health tech marketing contributor for Your Doctors Online. Disclaimer: This article provides general information and is not intended to diagnose, treat or cure any disease or medical condition. If you require specific advice, please consult one of our medical professionals through the app. However, in case of an emergency, please call 911. Should I Clean My Baby’s Tongue? How Do I Do It? © 2018 All rights reserved. YourDoctors.Online operated by HealthATech Solutions Inc.